The commanding general of the U.S. Army Reserve’s 99th Regional Support Command was the guest speaker at the sixth annual Our Community Salutes recognition ceremony at the Cavaliers County Club, Newark, N.J.
Maj. Gen. 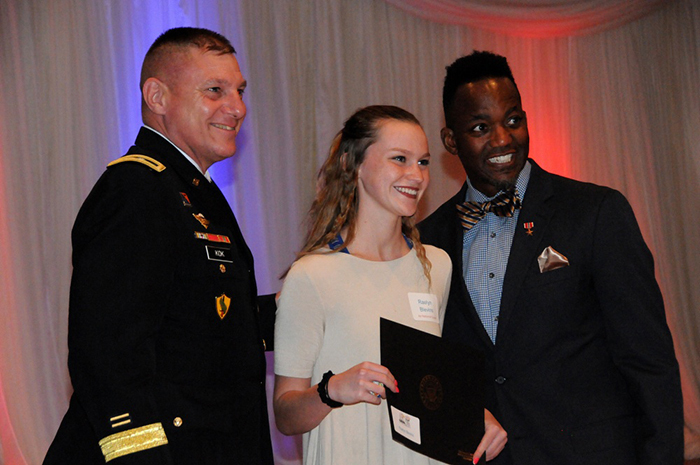 Troy D. Kok joined Wilmington University and the Association of the U.S. Army’s Delaware Chapter in honoring more than 100 high school students who volunteered to enlist in all branches of the U.S. military following graduation. “You’re moving into the greatest opportunity you could ever imagine, because the sky’s the limit – you can do anything and be anything in the United States military,” said Kok, a 35-year Army veteran. “I’m sure that most of you enlistees have at one point in the past had somebody say: ‘I’m so proud of you,’ and you deserve that,” said Cerchio, who was drafted into the Army in 1966 and retired as a lieutenant colonel. Our Community Salutes is a national non-profit organization that helps communities recognize, honor and support high school seniors who plan to enlist into the U.S. armed services after graduation. Our Community Salutes also supports the students’ parents and families by providing them information and resources related to their children’s decision to join the military. “Your sons and daughters are getting ready to go on the greatest adventure in their lives, and that’s what we’re here to celebrate tonight,” Kok said. These young men and women will become part of a military in which less than 1 percent of eligible Americans volunteer to serve. “As you swear to uphold and defend the Constitution of the United States, you will become part of the real one percent – the one percent that makes it possible for us to be here tonight,” Cerchio said.